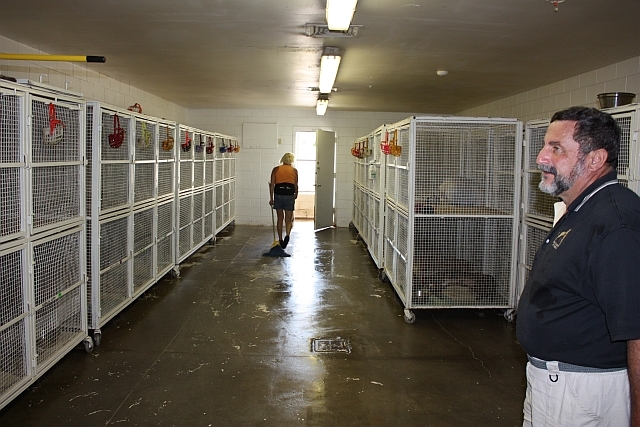 Every boarding kennel should be as well cared-for as Dennis Tyler’s adoption kennel at the Melbourne (FL) track is. You have to leave your greyhound at home while you take a cruise in the Caribbean; no dogs on shipboard. You’re going camping in a state park, and dogs are not permitted. You’re visiting relatives, and Aunt Tillie is allergic to dogs. You’ve never had to board this dog before, and you are worried about him. How will he survive without you? Who will tuck him in at night? Will he eat? Will he mourn and become depressed? Will he think you are abandoning him? Dogs are like people. They come in all personalities. Some of them take on a boarding experience like any other experience — they enjoy visiting the other dogs in the kennel, they like meeting strangers, they eat whatever is on the plate, and they take advantage of the new surroundings. Other dogs are reluctant to adapt to new situations. They are nervous and excitable. They are too worried to eat at first. They don’t trust strangers. Greyhounds who have raced or been trained at racing kennels have an advantage: None of this is new to them. If their experiences were good at the track kennels, they will take boarding in stride. They are used to being handled by strangers, and they know nothing is forever. Even a nervous, uncertain greyhound adapts to a boarding kennel well, because he’s been in similar situations before. That’s why most boarding kennels are happy to take in ex-racers, because our beautiful dogs know the ropes already, unlike many other house pets. All these generalizations don’t help you, though. You still worry. That’s just natural. The best way to find a good boarding kennel is to ask friends who treat their dogs the same way you treat yours. Other greyhound owners can help. They can guide you away from kennels where they’ve had bad experiences, and they can recommend the kennels they themselves use. If you don’t have the resource of other greyhound owners in your area, then you’re on your own. Many veterinarians offer boarding services to their clients. These services are not often the best for a greyhound. The dogs are usually kept in cages and let out only to eliminate a few times a day. There’s often no one on staff at night, and the last turnout may be around 9 p.m. On weekends there may be very few people on hand to tend to the dogs, and that sometimes will be the vet himself, taking care of emergency situations and post-op patients. Then there’s the problem of exposure to diseases — not an issue with a really healthy happy hound, but something to consider. At a good boarding kennel your dogs will be tended to regularly, allowed more or less unlimited access to the outdoor run areas, and the owner usually lives on the premises. The last turnout will be just before the owner himself turns in for the night. A vet will be on call in case of trouble, but many boarding kennels go for years and years with no need to call on the attending vet. In order to choose a boarding kennel first call around and ask questions. What kind of facilities are available? Does each dog have an indoor-outdoor run? What shots are required? What’s the price? May you go visit the kennel? Make an appointment to see the kennel. Don’t just drop in unannounced unless the kennel owner suggests it. You may arrive just at feeding time and interrupt the dogs’ schedule. Or when the owner is busy grooming dogs, and unable to drop everything at your whim. Or he may be taking a shower himself, or eating a late lunch. Be considerate. Do you drop in on strangers yourself? Do you appreciate having unannounced visitors whose primary interest is checking up on your housecleaning? The reason for making an appointment is simple courtesy. It has nothing to do with rushing to clean up the kennel just before you arrive! The kennel is kept clean for many reasons: It’s easier to maintain if it’s clean. The state inspector can drop in at any time. Returning clean dogs to their owners is much nicer than returning dogs with feces all over them. When you visit the kennel look at the size of the accommodations. Are the runs cement based and sloped for drainage? Is the fencing in good condition and at least six feet high? Are the individual gates secured with dog-proofable latches? Are there guards on the top to prevent the dogs from climbing out? Is there safety fencing on the perimeters in case a dog bolts out of his run when the gate is opened? Is protection from sun and rain always available? Is there a water pail or dish in each run? Is there water in the pail? Are the runs at least four feet wide and twelve feet long to accommodate an active greyhound? Is the opening to the inside part of the run tall enough for a greyhound? You may notice a smell of urine at a boarding kennel. It is difficult to clean up immediately after every dog urinates. But the smell should be of fresh urine — not the funky smell of old urine. Any feces in the runs should be obviously fresh, not days old. There shouldn’t be food scattered around. The stainless steel food dishes should be relatively clean, if they are in the runs at all. You can’t expect a kennel to look like your bedroom. A collection of dogs will make some amount of mess in a very short time. But the mess should be picked up several times a day, and the runs should look neat. Look at the other dogs there. They will be excited to see you, and barking. There may be some that are fearful, avoiding contact. Remember that those dogs are probably that way with their owners, too. But most of the dogs should be anxious to meet you and the kennel owner, with tails wagging. All the noise they make while you are there may be upsetting to you, but remember they spend the rest of the time sleeping or playing with the dog next to them. The noise is not a constant occurrence. Some kennels offer “playtime” when they let several boarders out together in a large exercise area. This seems to be very popular with some clients. It is not a good idea, though. Dogs that don’t know each other may get into fights or play too hard for your greyhound with his tender skin. A very assertive dog can do a lot of damage in a very short time. Even supervised dogs can hurt each other very quickly. Most important of all, do you like the kennel operator? Does he or she seem to enjoy dogs? Does he like to introduce you to the other dogs and tell you a little about them? Does he know their names? Dog kennel operators may not have the best bedside manner with people, but that doesn’t mean they are not fond of dogs! Watch his manner with the dogs that are there. The kennel passes your inspection. You make a reservation. The day comes to take the dog there at the scheduled time. What do you take with you? For greyhounds a pile of blankets is a necessity. Don’t take stuffed beds or Styrofoam mattresses. For some reason every greyhound I’ve boarded has succeeded in tearing these mattress covers and strewing bits of stuffing all over the place. The expensive bed is destroyed. Old blankets and soft rugs are best. They may get destroyed, too, but they are disposable. You don’t need to take food dishes. Kennels supply sturdy stainless steel dishes which are easy to clean and you won’t lose your favorite dog dish in the shuffle. Take off any slip collars you may use. A simple buckle collar with or without ID is sufficient. Choke and semi-choke collars can get caught in bucket bailers or parts of fencing. If you want, take some disposable toys your dog is fond of, just making sure nothing is so small he can swallow it. On a first visit you will be asked to show proof of vaccinations and rabies shots. Take the certificate the vet gave you, or the most recent computerized statement from your vet with dates of the shots administered. Some kennels may require a copy of the dog’s license as well. Ask what the kennel owner needs to see, and be sure not to forget to take it. Make sure the dog is free of ticks and fleas. No kennel operator appreciates taking in an infested animal. Expect to be charged if the kennel has to spray or dip your dog for parasites he arrived with. If you know your dog is sensitive to a particular chemical make sure the kennel operator knows about it. Be sure the kennel operator knows who your regular veterinarian is. If you like, you may leave an emergency phone number for him to call in case he needs to get in touch with you, a friend or a relative who likes your dog. But don’t expect the worst — just be prepared for it. It’s sort of like lighting a cigarette while you’re waiting for the bus to arrive. Your dog may raise a ruckus as you walk away, leaving him behind. Try not to burst into tears, and don’t over-reassure the dog. Act confident and happy in order to assure him everything is okay. It will be better for him, and you can cry when you get back to your car. I promise you, the moment you have driven away the dog will sigh, look around and interest himself in his new surroundings. I know you won’t believe that, but it is true. Dogs are wonderful creatures. Survival is very important to them. As an aside, please don’t take your teenage daughter along when you drop the dog off if she’s the type who is going to go hysterical when you force her to leave her buddy! It’s just upsetting to the dog, who thinks he’s done something wrong to make her cry. In all the years I’ve been boarding dogs I’ve never had a dog refuse food for more than a day or two. The owners may tell me their dog is a picky eater and undoubtedly won’t eat anything I give them, but, believe me, it isn’t true! Just the sound of other dogs eating seems to turn on the hungry juices. Your dog will not starve himself to death in a boarding kennel! Quite the contrary…. If you want to keep your dog on a particular diet, take his own food to the kennel. Don’t be surprised if you are charged an extra fee for this service — with some kennels it is more trouble to store and serve individual diets than it is to use the kennel’s own food. And if your dog is on any kind of medication be sure to take it along, with explicit instructions on dosage and on what the medication is for. Again, some kennels may charge a fee for medicating, but you need to keep the med schedule intact. If the dog is going to miss a heartworm preventative while you’re gone, take that along, too, with the day the pill is due to be given. If you worry about the dog, take the kennel phone number with you and feel free to call to check on him. Kennel owners are happy to tell you how your dog is doing, and often will have a cute story to tell you that will remind you of what a wonderful hound you have. Have a happy vacation, even if it is with your in-laws! The dog is in good hands with a dog professional, and he will be glad to see you when you return. He may sleep for a week back at home because he’s worn out from all the activity at his very own summer camp! Terrill Schukraft operated Northcountry Kennels near Hershey, Penn. for over 30 years until she retired early in the 21st century! She passed away in 2010.